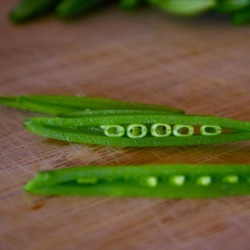 These Peas are Hollow: Tarts and Cakes and Bundts Oh My! Tarts and Cakes and Bundts Oh My! Whew, I can finally breath. and sit. It has been a particularly busy past few weeks, with not a single moment to write a post...or sleep for that matter. I can't complain too much though, I got to spend every waking minute (when I wasn't at one of my two jobs) in the kitchen. After the success of the tarts I made for my good friend's bridal shower, she apparently had enough confidence in me and my newly acquired baking skills to ask me to provide the dessert table for her wedding reception. I quickly said yes, and then realized what a monumental task this was going to be. It all came together after about two and a half weeks baking and filling the fridge and the freezer full of tart shells, mini bundt cakes, pistachio brittle, and cake pops. 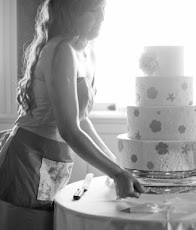 It was an amazing learning experience, the bride and groom were extremely appreciative, and all the drunken wedding guests enjoyed the abundance of baked goods when 10:00 rolled around at the reception. The day after the wedding was spent catching up on sleep, nursing a slight hangover, and actually eating food other than cake and sugar for the first time in about a week. When Monday hit, I was right back at it, baking a three-layer red velvet cake and a dozen cupcakes for my boss's baby shower. I guess almost 700 mini desserts wasn't enough, I just had to get back in the kitchen. I am going to have to slowly chisel away at all these pictures and recipes that I have accumulated over the past few weeks. I have decided to start at the end of my baking extravaganza and work my way back. The photographer at the wedding was nice enough to stick around and take some pics of the dessert table, so I will wait until I get my hands on some copies to present the table in its entirety here. But first, the red velvet cake. 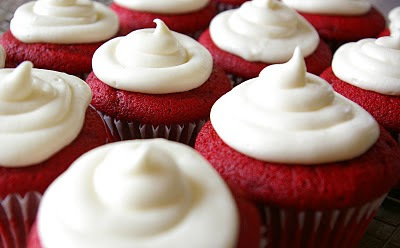 I was always under the impression that a red velvet cake wasn't really anything special, just a whole lot of red food coloring. Turns out, some buttermilk, cocoa powder, baking soda, and a teensy bit of vinegar can really take an ordinary cake to a new level. This was some of the fluffiest, moist, flavorful cake I have ever had. 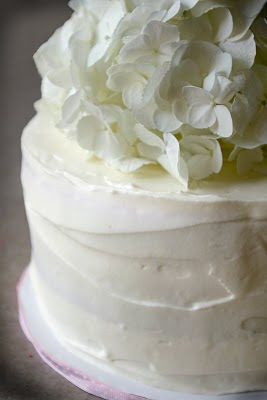 Topped off with some cream cheese frosting and a big bunch of hydrangeas for decoration (stolen with permission from the wedding), this cake was a big hit at the shower. I had some leftover batter so I threw in a dozen cupcakes for good measure. Each batch makes 2 thick 9-inch layers, or 3-thinner 9-inch layers, or 1 thick 9-inch layer and 12 cupcakes. I made 2 batches, and ended up with a fairly tall 3 layer cake, with 12 cupcakes on the side. Butter and flour your cake pans and set aside. Preheat your oven to 350 degrees F.
In a large bowl sift the flour, baking powder, and salt. In a small bowl, mix the food coloring and cocoa powder until completely incorporated. Set aside. In a stand mixer (or using a hand mixer) cream the butter and sugar on medium high speed until light and fluffy. Add the eggs one at a time, and beat until thoroughly combined, being sure to scrape down the sides. Add the vanilla and the red food coloring-cocoa mixture and beat well to combine. Add 1/3 of the flour mixture, beat on medium speed until combined, then add 1/2 of the buttermilk, and beat until incorporated. Add another 1/3 of the flour, beat well, then the other half of the buttermilk, scraping down the sides after each addition. Finish with the last 1/3 of the flour mixture and beat until just combined. In a small bowl, mix the vinegar and baking soda, and immediately add to batter. Mix on high speed for just a few seconds until evenly dispersed, and pour right away into cake pans or lined cupcake pans. 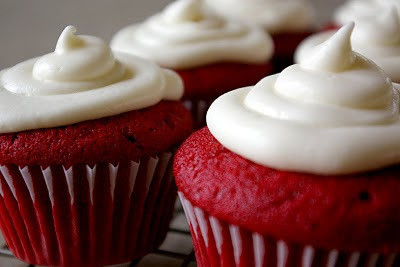 Bake 2 9-inch cakes for about 40 minutes, (less time if you are going with thinner layers, and about 20-25 minutes for the cupcakes) or until a toothpick inserted into the middle comes out clean. Let cool completely before frosting. 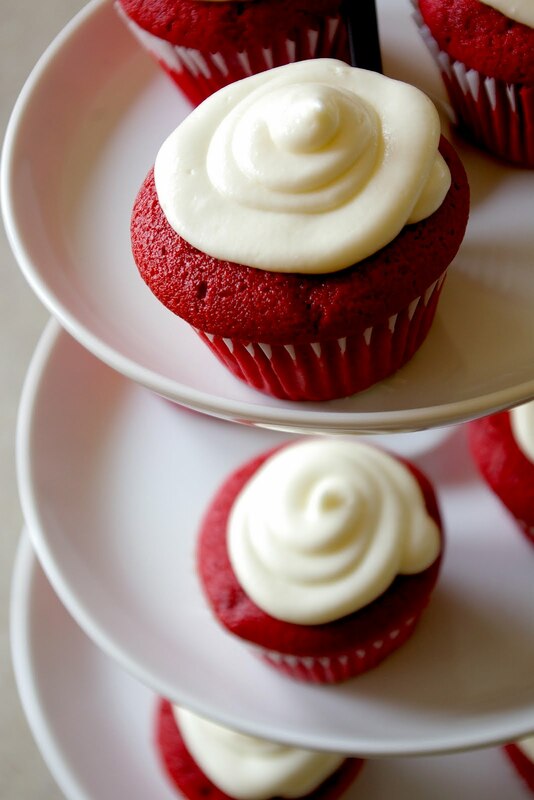 I made a double batch of this frosting and had enough to generously frost a three layer cake and pipe a good amount onto 12 cupcakes, with some leftover. In a stand mixer, combine the cream cheese and butter, and beat on medium high speed until smooth. Add the vanilla and salt and mix until incorporated. Gradually add the sugar, and beat until light and fluffy, about 3-4 minutes. I will say though, that I think the best part of making a multi-layer cake, is having to cut the domed tops off each layer so that they lay flat. You then have an excuse to eat cake scraps all afternoon. We wouldn't want them to go to waste now would we? They look delicious! 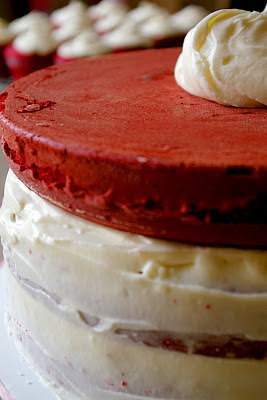 I haven't gotten around to making red velvet cake but really should! Especially if you have a tried and true recipe I can use. I can even find a way to tie in some blue to make them for Memorial Day =) Great work, Bria! I love checking out all the stuff you make! Very impressive! These really look gorgeous and totally professional. Oh, and delicious! I would be very honored if you checked it out. Thanks! I think I fell in love with them. Is this the same recipe you us to make the cake bites/pops?